Many Amish often do their canning in their building entry/wash room or shop building. In Arthur they usually had an old gas stove/range which they kept in the shop or wash room to do their canning on. In Indiana we don’t see that as much. However I did find the following homemade canning range at the personal property auction of a retired cabinet maker last fall. 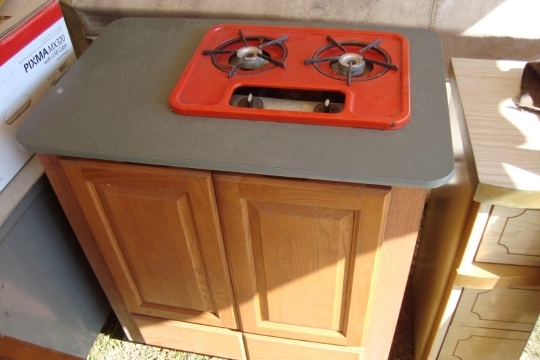 He took a base cabinet, added a countertop and mounted a 2-burner range unit that was made to mount inside a camper. The propane tank would be stored inside the cabinet. This is a good example of Amish creativity. SHOM, I am already canning, cooking and baking up a storm this year, LOL. But I have no “other half” to do a honey do list for me so if I were to get this, I would have to do it myself, LOL. We are feeling like summer today, it is currently 90°F and I have been baking breads and rolls all day. 🙁 Summer, I love it and hate it at the same time!! Here in Big Valley, some have an outdoor oven type wood burning stove that I’ve observed the woman taking jars of canned goods out of. One woman I talked to said they bought one of those deep fryer turkey cookers, only then put water in it and boil their corn, then cut and freeze. Eliminates all that fuss inside. We have an old set kettle fireplace, which my husband builds a good hot wood fire, and has the old copper kettle set in position. Now the corn cooks there and we have no steam and heat in our new kitchen! Sometimes the old ways are the easiest! These can be found in most old pop-up travel trailers being scraped. (I believe it’s an old Magic Chef) The best ones have one large single grate over both burners to support large pots better than the two small grates. Other small RV’s without cooktop/oven combination use them as well. They are not a very high BTU burner. A secondary cookstove (wood / coal) on a covered back porch is common around here. It’s a way to do baking during the summer without adding heat to the house. Heavy duty canning is done when a bunch of the women pull an “all nite canner” and fire the stove hard until done. The thinner walled cookstoves (newer steel plate, not cast iron type) are made of “gauge steel” and warp. They don’t last forever using them like that. One of the main reasons I went to a Kitchen Queen made of thicker quarter inch steel plate. That’s what it takes for a larger garden. We used to use a stove top burner on a Garland commercial range that was 30,000 BTU, (normal output for a 5 sided star shaped commercial burner) but removing an eye over the fire on a cookstove and setting the canner over the open fire is hotter and continues the boil better than propane. We’ve found getting the temp up fast prevents the slow cooking of many vegtables that softens them. Especially pickles and chow chow. It won’t stay crunchy with a lower BTU burner that cooks them until soft before boiling. The turkey cookers make excellent outside stoves for canning if you only use one canner. The sporting goods stores also have 2-3-4 burner stoves that are easy to set up and use outside. They work great. NO DOT propane cylinders should ever be taken in a building. EVER. That includes garages, and sheds. Also installing inside a cabinet is a no no. If the relief valve opens, or there is a slight leak at the connection, or around valve stem, the vapor cannot mix with air in the atmosphere where it quickly is too lean to burn. LP is safer than gasoline, since the vapor mixes with air very quick and is no longer within it’s flamable range. Containing it in any enclosure creates an explosive mixture, not just a flammable atmosphere. Cylinder cabinets on RV’s are vented properly to the atmosphere. Many with open bottoms. Propane is heavier than air and drops quickly. The regulator should also never be mounted in an enclosure, since if the diaphragm leaks, propane comes out the vent hole in the regulator. National fuel gas code requires 10 feet from an ignition source. (includes light switch, electric meter, A/C units) Outdoor gas grills are exempt. These are national standards, NFPA. Not by state. The technical term used is “relief valve must remain in direct communication with atmosphere”. Labor and Industry and the fuel supplier police’s the issue in PA. Reminds me to go get those two propane bottles out of my garage. I unloaded them from the carrier on the car after our last outdoor cooking deal and sat them inside the garage door “for the time being”. That was over two months ago. I knew better, but.. I suspected from some of your previous posts that you were somehow involved in the energy business; distribution, service or both. Your are far too knowledgeable to be someone with just a casual interest in the subject. Paul, did you own a propane distribution company AND do service calls, or did you do one and not the other? The reason I ask, is I spent a good part of 1990 and 1991 trying to buy out a propane dealer in the Texas Hill Country, west of San Antonio & Austin. When I was ready to buy he wasn’t quite ready to move on the deal & by the time he was ready to sell out I wasn’t in a position to buy anymore. Turns out to have been a great blessing, because he ended up having some very serious legal issues associated with his business. It ultimately caused him to lose everything he had. Had he sold when I was ready to buy I would have literally purchased those problems. Sometimes God is looking out for us even when we aren’t aware of it. After 4 years of auto mechanics during high school Vo-Tech, the VW Audi dealer I worked for closed. They also had an RV business on the back lot. Trouble is they got rid of the guys that serviced them before they sold them all off. So I was elected to “get them out the door”. I liked working on the “house” part more than cars, so opened my own RV service business. During winter months I worked at Steamtown as a locomotive mechanic satisfying my steam hobby. This led to work on antique farm and Amish related equipment. Still not a “full time job”, since it was an as needed only type work. Since I had the propane experience with RV appliances, I was also on a referal basis with a few gas companies for their service work during their busy season. Come spring, I had my own RV customers and my own business to run. The propane companies of course wanted me full time. I ended up starting my own propane service business installing and servicing propane equipment until I retired both businesses in 2008. I did everything but supply product. Including hydro testing on boilers, cylinders and tanks. Distribution becomes a rat race, not for me. Yes, the Lord has provided enjoyable work for me my entire life. I stay connected to the industry in retirement with my wood stove refurbishing and collecting hobby. It now provides information, company history, and heating advice through the largest hearth and heating website in the world. Kind of ironic isn’t it that Amish youth go through only 8 grades of formal schooling & then many participate in a type of hands on vocational training within their own community before entering the world of work. Contrast that to the way we do things; all the time and $$$$ we spend. I’ve never heard of an Amish person on welfare though, have you? Contrast that to 40 million people in this country who are on food stamps. Something is not quite right here. I gues I missed it before,what hearth and heating website are you referring to if you don’t mind my asking? Sounds like something I should check out. Interesting discussion between you two gentlemen, OldKat & Paul Long. I agree wholeheartedly about the need for vocational training. I remember there being a number of “vocational” high schools in Chicago when I was a kid…I remember some being closed and wondered why. I wonder how many are left? My nephew attended one, got a well-paying job from which he recently retired after 30+ years. He has a more than decent pension and can still enjoy his kids (18 & 20) being home a bit longer. The Amish way (of “vocational” training after 8th grade) seems more sensible for the most part…a narrower, but surer path to truly making a living…but they also keep it “simple”. I wonder if that can be achieved anymore in an “English” (“gimme-gimme”) world? Hearth.com is the website. I moderate the Classic Stove Forum for stoves before EPA certification and started the Fisher Forum to specialize in Fisher company history, stove details, manuals, and basically customer service for the stove company that shut down in 1988 due to stricter smoke regulations. Bob Fisher (Oregon) invented the air tight stove and built the first steel plate stove that has become the Amish way of simple building as well. I bought out the remaining parts and maintain the largest collection of them known. I travel for the rare ones, and freight the early originals from the west coast. I only pressure can inside my house.. it doesnt heat the house up at all.. I water-bath can 100% outside using one of the aforementioned Turkey Friers. So far, Im still good to do the lifting.. an elderly woman might need a helping hand if she wanted to can a double-decker. The Amish homes I’ve been in have a summer kitchen or a half basement that has a canning kitchen in it.. I do mine on my driveway patio area in my back yard.